My Birthday is this month, the 14th to be exact. The gifts have already started pouring in...I got free lip gloss from Sephora, 15% off my purchase from Anthropologie, and free ice cream from Coldstone. In the spirit of giving, I will be giving away four $25 gift certificates to my shop. Here is how it will work: write a comment on the blog and your name will be entered to win. You can comment as much as you like, but your name will be entered only once per post, starting with the Website Sneak Peek just before this. The names will accumulate for the whole month and each week I will draw a name and declare the winner on the blog. Good Luck! BTW, not me in the pic. 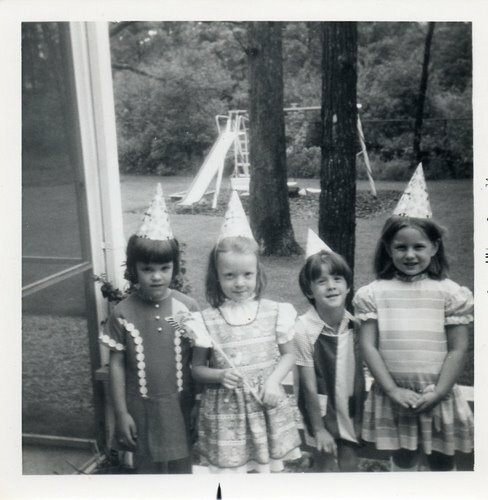 I found some great vintage birthday pics here. Happy Birthday Month! Glad to hear that you have had a nice start to it, too! Would love to win a gift certificate to your gorgeous store!!! Pick me! Pick me! Looking forward to the Speakeasy event! Love love love the new site touches. Local OC gal ready to see you at Speakeasy, am I right? I love your creativity. And i would love to see you! Sweet birthday promotion - and your blog looks awesome. I would love to win, because it is my birthday month too! Great blog and happy birthday month!! P.S. If you love vintage photos, check out the ones on my Etsy site. I have tons! What a wonderful month to have a birthday in!!! September and October are my favorite months of the year. And thank you so much for the chance to win a g.c. to your shop!